Is yoga blogging a selfie in words instead of pictures? 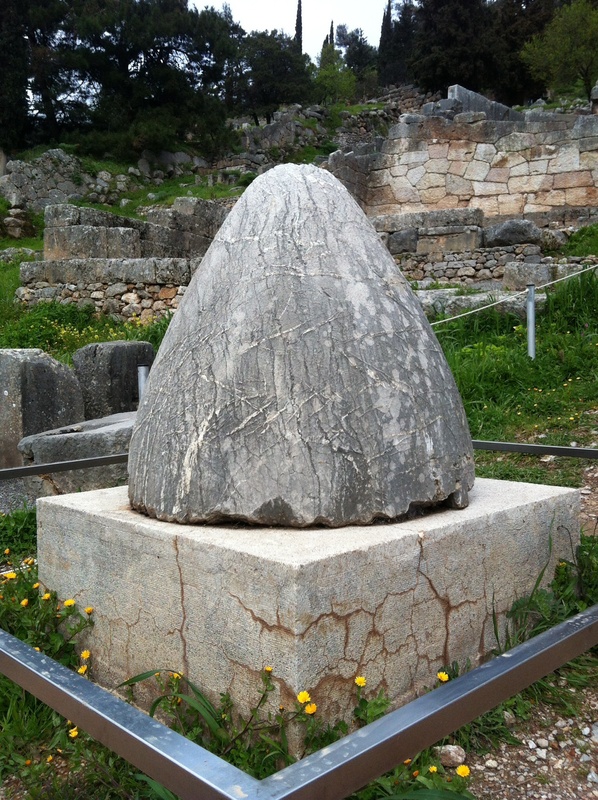 My last days in Greece are at Delphi, known to the Ancient Greeks as the centre of the world: the myth is that Zeus sent two eagles off in opposite directions and they crossed paths at Delphi, so Delphi was called the ‘navel’ (omphalos) of the world. Cue many comments from my husband about ‘navel-gazing’ as he likes to refer to my blogging! Don’t get me wrong, he supports my blog but he teases me about everything! But this is making me think a little about why I choose to blog. I’m usually so much not a publicity-hound, I don’t have endless hours to spare in my analogue life, and I certainly wouldn’t argue that cyberspace needs another yoga blog. The navel-gazing comments have got to me a bit and made me wonder if blogging about yoga is a self-centred activity, just another parade ground for my ego. Is it in fact the verbal equivalent of the yoga selfie? … in anyone who takes such images at face value. I really wonder if it’s not just the medium that is the culprit (the social networking that is increasingly part of our lives) but also the message we individually attribute to it (our own often subconscious interpretations of such images). But I don’t think yoga selfies are any worse in this respect than any other area of life. It’s always a case of ‘caveat lector (or spectator?)’. More fool us if we believe even half of what’s posted online, any more than we believe what the newspapers tell us. It’s lies, damn lies, and yoga selfies. But if individuals want to post these kinds of pictures for celebration of or gratitude for their practice, for promoting their livelihood, for self-affirmation or whatever else, I can understand that, and it’s not for me to judge. I’m not claiming immunity to such whims myself! Sometimes esprit de faire-yoga (as the French undoubtedly wouldn’t say) is too compelling and sharing something of the magic of my moment just feels right. On the other hand I don’t think any of my selfies are likely to give anyone an inferiority complex! It’s meditative thoughtfulness come to life. It’s connection and community and all the things we pursue in our practice, except that it’s a way to stay connected while we’re away from the studio. I think this is it for me. Blogging is a way of exploring my yoga through the purposeful (yes one could even call it ‘meditative’) act of writing. This is certainly what I hoped it would be when I started my blog. The act of writing helps me to reflect on my practice and what I’m discovering and learning. It helps me ask questions and start formulating my answers to them. Plus I find it’s also loads of fun, a good creative outlet given that these days I’m very out of practice with writing anything other than a business case or progress report. So perhaps intention is all important in blogging and in selfies, as in yoga practice. I reckon it’s intention and attitude that turns asana into something more than the purely physical. Selfies are usually a presentation of the perfected form, disassociated from any sense of ‘practice’, effort, or discipline (let alone any spiritual aims). And it’s this lack of context that arguably makes them problematic for their viewers. Blogs in contrast are a more mixed bag, ranging from the authoritative and pedagogical to the intensely personal. Some of them seem as removed from the reality of practice as much as selfies do, but others are a more self-conscious depiction of the highs and lows, and promote both self-study as well as community, support, and sharing. This seems very much in harmony with the ethos of yoga as I understand it. Delphi, where this blog post began, is also renowned for the aphorism inscribed on the Temple of Apollo “know thyself” (γνῶθι σεαυτόν). I think this applies most obviously to bloggers exploring their practice through their reflection and writing but might it also apply to selfie-takers who want to share their physical practice with others for various reasons? I say it should certainly apply to the readers and viewers of these forms of communication — understand your own ways of seeing, the messages you instinctively take. Plenty of opportunity for considering ahimsa and satya, as well as the difference between Seer and Seen, of offering and receiving. 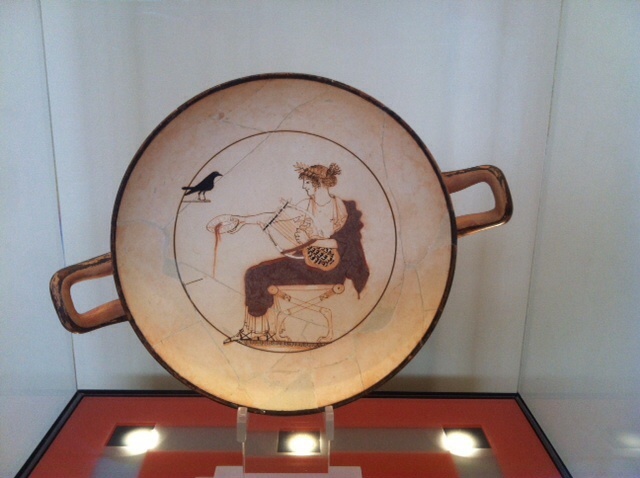 But before I leave Delphi I can’t resist sharing this pic from a piece in the museum there — the god Apollo with what is surely a babycrow! Great post! I too have been thinking about the ego-boosting aspects of blogging, as well as how easily one could use it as a vehicle for battling about ideas instead of dialog-ing. How to navigate around all of that will be a continual practice, I guess. Take care of that hamstring. Hi Homer, thank you so much for reading and commenting. I’m glad this meant something to you too – and I agree that negotiating the potential of blogging is an ongoing practice in itself. I think this is why I’m finding it so interesting though – it’s really making me reflect on what I’m doing, why, how etc. i started blogging since the changes in thoughts and experiences I was having through my yoga were quite disorientating, and blogging offers some stability to me. My hamstring is feeling quite the celebrity now – it’s in danger of developing an ego all its own! Well, guess what, I’m dealing with a hamstring thing too, so I’ll write about it and then your hamstring will have some company in the Ashtanga blogosphere. Interesting thought! I suppose it comes down to the blogger’s intention on whether the blog is a written selfie. For me, blogging has greatly helped my teaching because the whole blogosphere give me feedback on questions I bring up. This translates into more confidence when IRL students ask me similar questions. My beef with many yoga blogs (not yours of course) is that they tend to be shallow. Yoga is such a deep practice, that it is almost a shame to keep posts on just the physical and superficial level. Thanks for this post Baby Crow! hi yogibattle, thank you very much – I take that as quite a compliment coming from you. I can imagine that for a teacher blogging must be quite a different venture, and it’s interesting to hear that this practice and the online community support you. I wonder a lot about online writing and communication in general and whether the democratic immediacy of it necessarily tends to superficiality. It’s all coming back to intention again, I think. and yes even as a beginner (2 year yoga-versary coming up!) I sense the depth of the practice that is possible, and wonder how much of this can be expressed at all. I think i’ve lot of words left in me before that point though! Thank you so much for being in touch; I look forward to your next post. Clearly it’s important to ask why we are blogging, what about it is for us and what is our offering to our readers. And hopefully the two things come together in some mutually beneficial way. As you say yoga is a journey that can lead in unexpected directions and that can be a very positive message or experience to share.